Hello Guys, We sharing some beautiful romantic dialogues of Hum Tum Movie. This is a romantic comedy film directed by Kunal Kohli & produced by Aditya Chopra. The movie was released in 28 May 2004 and written by Siddharth Anand. Saif Ali Khan & Rani Mukerji had played main lead role while Kirron Kher, Rati Agnihotri & Rishi Kapoor were in supporting role. 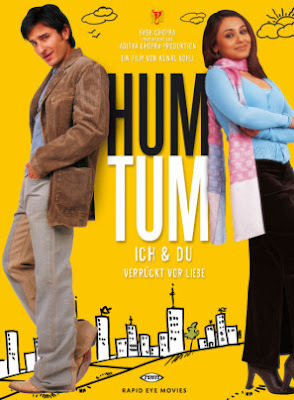 Hum Tum follows the encounters of the two main characters until they, after several years and various meetings, become friends and finally fall in love each other at the end of the movie. This is a very sweet movie. It won several award like Filmfare Awards, including Best Actress (Mukerji) and also won National Film Award for Best Actor - Saif Ali Khan. The move has some beautiful and lovely dialogues. All are beautiful delivered by Saif and Rani. I have collected best dialogues, lines, quotes of this movie Hum Tum. "Hum tum mein sirf ek hi problem hai ... Ki tum ke bagair hum adhoore hain"
"Har kamyaab aadmi ke peeche ek aurat ka haath hota hai ... Kyun ki auratein nakamyaab aadmiyon ke peeche nahi bhaagti"